Judy Bigg from the Northern Rivers of NSW has spent the last 8 years creating a wonderful garden including regenerating the area along their (usually) small creek with a mix of natives and exotics. The significant rain event in late March had a harrowing effect on her garden. 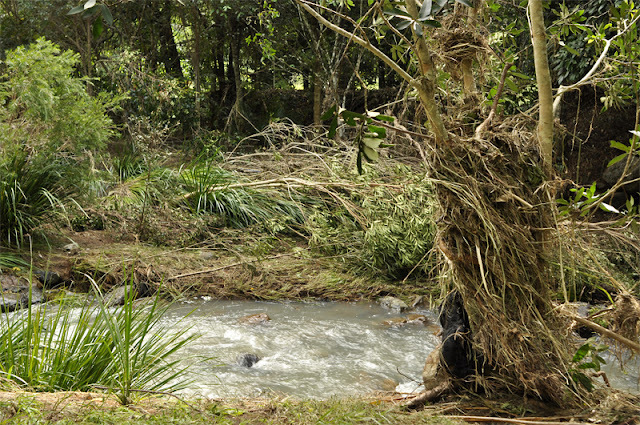 Rain of 1,000 mm in 48 hours - yes 40 inches in the old scale - created a raging torrent through her garden with devastating results (debris indicates just how deep this creek became during the flood). You can read more about this from the GardenDrum blog.